Actor driven movies are nothing new, so a movie where Sam Rockwell does the usual Sam Rockwell antics should not come as a surprise to anyone. If there is any surprise to be had by Mr. 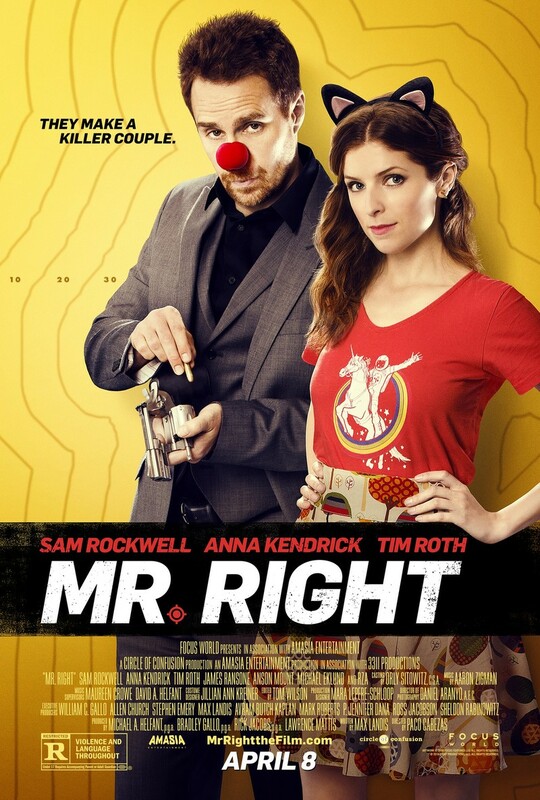 Right it is not in Rockwell but rather in Anna Kendrick, who - although receiving second credits to Rockwell - is actually the star of this movie about a woman going through changes. Maturing, if you will, through an immature movie. Kendrick plays Martha, a New Orleans girl who cannot seem to get it right with the boys. Until, that is, she accidentally stumbles upon a deranged hitman (Rockwell), who sees something special in her. As part of his derangement, our hitman is entirely honest with Martha; she just doesn’t take his statements at face value. Until, that is, she is confronted by reality. So Mr. Right is one of those romantic comedies. The comedy factor is heavily based on our hitman’s finesse at killing coupled with the way he talks to the baddies he kills; more often than killing them, he will talk them out of a life of wrongdoing. Further coming to the aid of this movie are the acting talents of Tim Roth, which get totally wasted on a crap role, as well as musician RZA who actually turns out to be a nice acting surprise. Does it all work? Sort of. Is it worth watching? I would argue no. There simply isn’t enough originality and quality in Mr. Right, despite all the right intentions.